As the public sector tries to understand how to use data better, a variety of challenges appear. There are the obvious ones, like resistance on the part of decision makers and issues with privacy laws. But as we’ve been interviewing performance auditors in all 50 states, one major issue keeps cropping up. It has nothing to do with giant computer brains, and everything to do with regular-sized human brains. There’s a great shortage of data scientists and analysts in the United States. The lack of sufficiently trained men and women for these jobs affects both the public and private sectors. McKinsey and Company has reported that "the United States alone faces a shortage of 140,000 to 190,000 people with analytical expertise and 1.5 million managers and analysts with the skills to understand and make decisions based on the analysis of big data." As a result, a city, state or county can spend lots of time and money producing crushing quantities of new information, without it having the kind of real-world impact that’s dependent on a sophisticated workforce to appropriately utilize it. New York’s Mayor Bill de Blasio, pleased with $1.3 billion in health-care savings, has given credit to a coalition of municipal unions in New York City. And it’s true that the work between the city and its unions, which is still in developmental stages, may ultimately pay off big time. But that $1.3 billion is really far more attributable to the fact that health rate increases were substantially lower than the city's projections of 9 percent hikes annually, according to the Citizen’s Budget Commission. (The increase for the 2016 fiscal year is 2.9 percent, which is similar to the growth rate in many other places.) This is the same phenomenon we see often when a city or state proclaims that it has a wonderful new surplus; all it really had was a conservative revenue estimate. There’s been a great deal of talk about the tremendous fiscal pressure exerted by non-pension post-retirement benefits -- “other post-employment benefits” or often dubbed OPEBs. Many states that offer these benefits (particularly health care) have not set aside much in the funds that are supposed to provide the payouts as years roll on. But there is tremendous variation in the liabilities carried by states. Amounts vary enormously, with just ten states carrying more than 75 percent of the aggregate $498 billion unfunded liability for states in the 2013 fiscal year, according to a brief published by the National Association of State Retirement Administrators and the Center for State & Local Government Excellence. Those states are California, Connecticut, Georgia, Illinois, Massachusetts, New Jersey, New York, North Carolina, Ohio and Texas. Many smaller local governments don't offer retiree health benefits. From the perspective of the employer, less than half of state and local governments provide retiree health insurance to individuals under the age of 65 and less than a third offer it to people over the age of 65. It’s common sense to think that students who are absent more are likely to learn less. But a new study about school absences takes this notion a step further. Using Massachusetts data, the study finds that this correlation is particularly troublesome as schools try to help launch low-income students on a path toward success The study finds a significant effect of individual student absences on their test scores and notes that low-income students are absent with greater frequency -- possibly due to transportation difficulties -- than students who are not poor. The National Bureau of Economic Research working paper, titled "Flaking Out: Student Absences and Snow Days as Disruptions of Instructional Time", notes that "poor students in Massachusetts are absent an average of 10.1 days a year, non-poor students just 6.9 days. Just 2 percent of non-poor students have more than 30 absences. More than 6 percent of poor students do"
According to a NBER digest summary of the paper's conclusions "poor attendance can account for up to a quarter of the math achievement gap between poor and non-poor students." Andrew Biggs, a commentator for the conservative American Enterprise Institute, argues that states are putting too large a portion of their pension funds in investments like equities and real estate that carry too much risk. On the other hand, Hank Kim, the executive director of the National Conference on Public Employee Retirement Systems, defends the approach that most public sector plans are taking toward investment, arguing that it doesn’t present a hazard for the states’ fiscal futures. Somebody is right here. Somebody is wrong. We’re not going to enter the fray. But we think it’s important that the debate avoid making generalizations about the states in aggregate. As is often the case, such an approach is meaningless, since there is so much variation among the fifty states. This chart, based on information from the Public Fund Survey, and presented by Biggs in the AEI’s blog, demonstrates that variation. 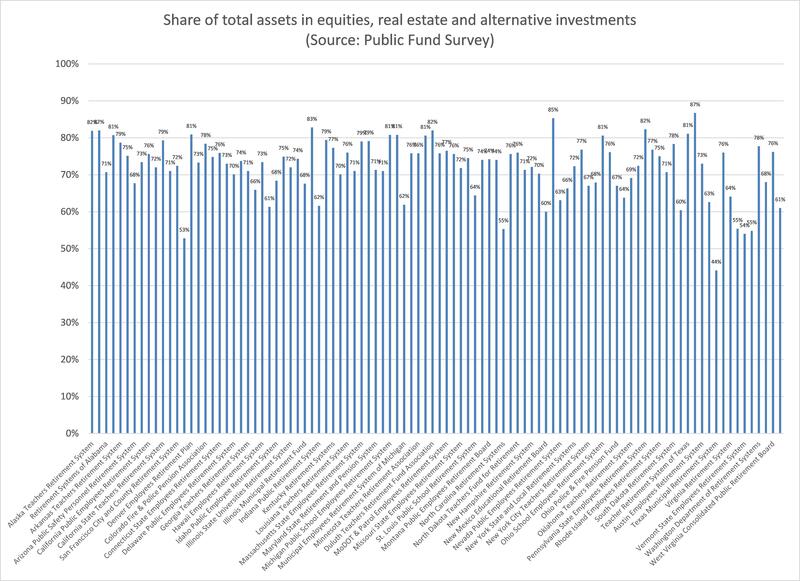 At the low end, 44 percent of the Pennsylvania State Employees Retirement System assets are invested in equities, real estate and alternative investments. At the high end, 87 percent of the Ohio School Employees Retirement System assets are. It's common for an administrative agency to provide a variety of services to departments or other government entities. But the need for the services often changes over time, which means that administrative agencies can miss out on current needs. Recently, the California auditor's office lambasted the Administrative Office of the Courts for a variety of ills. One of the most fundamental questions it brought up was whether the AOC was providing services that courts need now. The auditor's office conducted its own survey of courts and found that trial courts, on average, only used 55 percent of the AOC's services. For example, The Administrative Office of the Courts provides support to civics education programs "to improve civic learning and public understanding of the judicial branch, including the California Task Force on K-12 Civics Learning." But only 5 of 56 trial courts made use of this. As the audit points out, "Low rates of use do not necessarily mean that a service is not critical to the operations of the trial courts. However it is important feedback from the trial courts that can help the AOC evaluate the necessity and value of the services it provides." An evaluation of a summer jobs program for low-income young people in Chicago shows a marked reduction in violence for people who participated. In a randomized controlled trial, young people in the eight-week job program had 43 percent fewer arrests over a 16 month period compared to a control group. People in the program received minimum wage for 25 hours a week. The kinds of jobs they were given included working in community gardens, serving as camp counselors and serving as office assistants for aldermen. Half the people in the program worked for the full 25 hours while the other half worked 15 hours and receive 10 hours of "social emotional learning that was based on cognitive behavioral therapy principles." Both approaches were equally effective. The author of the study, Sara Heller, an assistant professor of criminology at the University of Pennsylvania, called the results "incredibly encouraging," noting that the impact on arrests for violent crime lasted more than a year and a half after the jobs ended. One interesting aspect of the jobs program was that it included an adult mentor assigned to each participant to "help youth manage barriers to employment." “What strategies ‘work’ in reducing crime and disorder in policing?” asks the Center for Evidence Based Crime Policy at George Mason University. In order to answer that question, the Center organized over 130 studies and created a matrix that it will update this spring. The matrix organizes the studies in such a way that policy makers and researchers can see what seems to be happening with various initiatives. The value of this work is easily seen by a finding about so-called “second” responder programs that address domestic violence. Police and social workers originally thought it would be a good idea for police to return to the house of a victim of domestic or elder abuse to provide more information after the initial visit. It turns out that, according to multiple studies, there is a "statistically significant backfire" effect. One study cited by this effort found that “those that receive Family Violence Response Team treatment have a 1.7 times greater rate of re-abuse." In the last B&G Report, we indicated that online education offered by colleges and universities in America may not be a good tool for financial savings, as one might expect. Hours after release of the Report, we received a very thoughtful email from Steven Thomas, Fiscal Officer of Eastern Ohio Public Health. It was perhaps something we should have mentioned in that piece.